Travel to an "Arabian nights" landscape and enjoy the unique setting wonderfully depicted in M. J. Schiller's TAKEN BY STORM. TAKEN BY STORM is categorized as paranormal, however, it’s really a historical novel set in a fictional land and time period (aka historical fantasy). But that certainly doesn’t detract from the beauty of the story. Ms. Schiller creates a wonderful landscape and rich characterization that mimics an Arabian world and a history that feels as authentic as if I had been there with Tahj and Bashea. The story starts with political upheaval that destroys life as Prince Tahj knows it, and sheep-herder’s daughter Bashea suffers the worst fate imaginable to a woman. Yet, they find each other amidst a takeover coup at Prince Tahj’s family castle, and manage to escape into the desert. Despite their differences, loyal and shy Tahj and strong-willed Bashea begin to have feelings for each other as they seek out Bashea’s family to return her to safety. Even when Tahj must leave to avenge his family, he can think of nothing but building a safe life for himself and Bashea together. 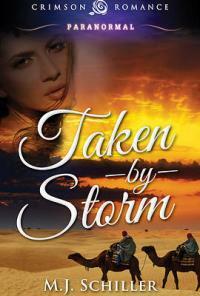 TAKEN BY STORM is full of adventure, peril and over-protective families. Through it all, Tahj and Bashea fight to come together. With a backdrop of distrust, betrayal, and class differences, their romance is organic and real. You can’t help but fall in love with the world Ms. Schiller has created and the love story that will stay with you for a long time after you read the last page. I highly recommend TAKEN BY STORM.